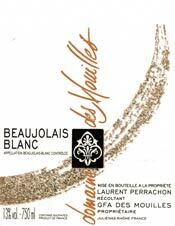 Unexpected and delicious, Beaujolais Blanc wine is becoming increasingly popular. Made from the Chardonnay grape, known locally as the "Perle Blanche" (white pearl), this wine develops subtle perfumes of white blossom with a touch of citrus fruit. Serve chilled at 10° C, for any special occasion. Unexpected and delicious, Beaujolais Blanc wine is developping subtle perfumes of white blossom with a touch of citrus fruit. Serve chilled at 10° C, whenever the fancy takes you, alone, with fish, or a light poultry. At its best when it is 1 year old. Thermoregulated fermentation between 15 and 17°c in stainless steel vats.